The idea for this Space Shuttle reminds me of the ads you used to see for a “real working submarine” in the backs of DC comic books. Something always gnawed away at me, and I figured that for 20 to 30 bucks, the sub had to be made out of cardboard. I was a pretty smart kid. Now, here is a space shuttle that makes no bones about being made out of cardboard, and 100% recycled board at that. 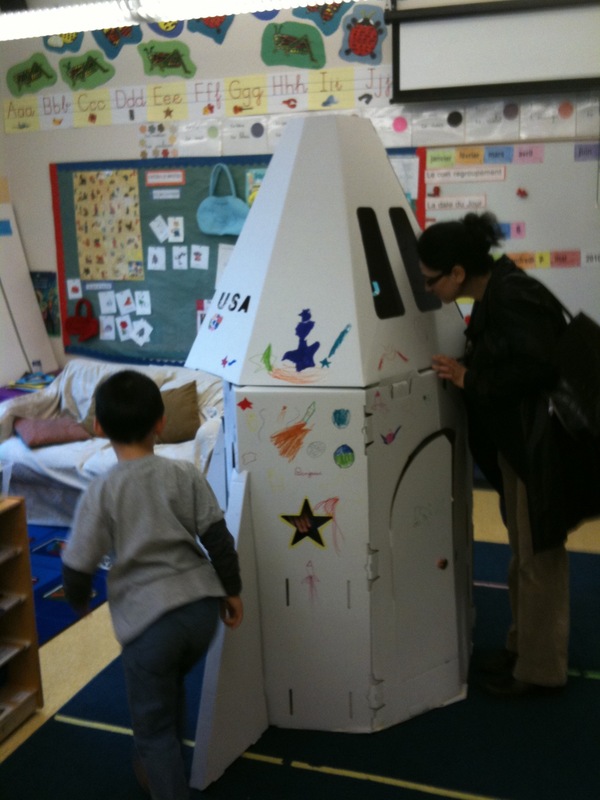 It’s the KidsCraft “Shuttle Imagination,” a ready-to-fold-and-make space shuttle. It’s not for older kids, but for 3-9 year old set, who can still enjoy the fun and imagination of playing with a big cardboard box. We brought ours in to my son’s kindergarten class and the kids went wild. They decorated the plain white outside and inside with colorful drawings and of course, their names. This is a simple, but fun toy for kids. At $69.95 ($10 less for a house version), it’s not for everyone, especially since it is at some point disposable, but it is easy to construct and will provide an imagination space kids love. The KidsCraft line of cardboard was developed by three dads who marveled at how kids will play with cardboard boxes for hours, while $50 toys become boring after a few sessions. They realize that a big refrigerator box would probably work just as well, but how many refrigerators do you buy during a child’s wonder years – now you can give them that experience today. Giving back to the community is an important part of their business plan and several national children’s charities will benefit from their inaugural year of sales and product donations. The KidsCraft Shuttle and other construction projects, are available at their website at www.kidscraftusa.com.